Some ninety minutes before the attack on Pearl Harbor, Japanese battalions began landing at Kota Bharu in north-eastern Malaya. British and Australian aircraft, although outnumbered, engaged the invading force but were little match for the Japanese who retained air superiority throughout the campaign. 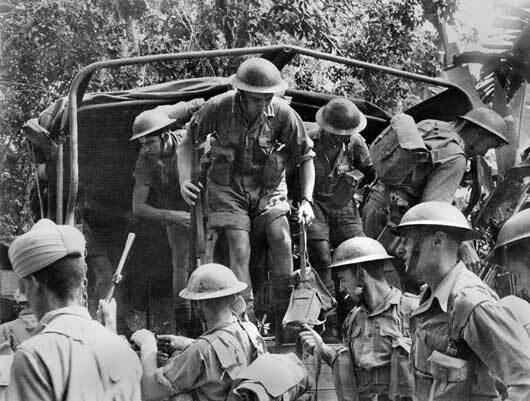 The 8th Australian Division stationed in southern Malaya fought its first significant action in an ambush at Gemencheh (Gemas) bridge on 14 January 1942. On 17 January, two Australian battalions were sent to support the inexperienced 45th Indian Brigade on the coast near the Muar River. The force was hard pressed and with the road behind them blocked, the Australian–Indian force fought a desperate fighting withdrawal to Parit Sulong which was reached on 21 January. However, Parit Sulong was occupied by the Japanese and the forces withdrew in small parties with only 400 of the Australian reaching Yong Peng. Ten days later, the Australian, British and Indian troops on the Malayan mainland withdrew to Singapore Island. Partly because the Australians had fought well in Malaya, their depleted battalions, most of which were at half-strength, were placed in the key north-western sector of Singapore island. The 8th Australian Division had an excessively long frontage of 12 miles to defend and would be committed to action as soon as the landing occurred. The Australians received reinforcements in late January and early February but many of the reinforcements were recent recruits, not acclimatised to either the army or the tropics. After 10.00 pm on 8 February, following intense artillery and aerial bombardment, the Japanese landed from 260 landing craft into the Australian sector. The Australians directed machine-gun and mortar fire on the enemy battalions involved, but failure of communication prevented effective use of artillery, and Japanese numbers and tactics prevailed. By the morning of 9 February, the Australians had fallen back to Tengah airfield. Reinforcements were committed, but they were not capable of launching the desperately needed counter-attack. At about 9 pm that night further Japanese landings had begun near the causeway and after hand-to-hand fighting, the Australian defenders fell back. On 10 February, a new defensive line was being formed between the headwaters of the Jurong and Kranji Rivers. By 14 February, with the defence line on the outskirts of smoke-wreathed Singapore and with the water supply compromised, surrender or slaughter were the only options. 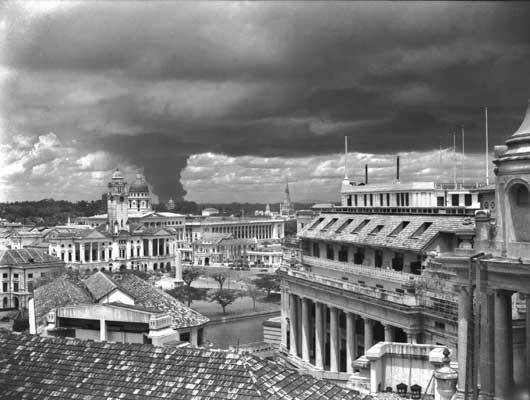 Singapore capitulated on 15 February 1942. More Australians died in the fighting for Malaya and Singapore than in any other Australian campaign in World War II except for Papua from July 1942 to January 1943. More Australians were captured in these campaigns than in all the other campaigns in Australian military history combined. More than one third of the men and women captured would die in imprisonment. Australian troops alighting from a truck during the Allied retreat to Singapore (AWM 011303/29). 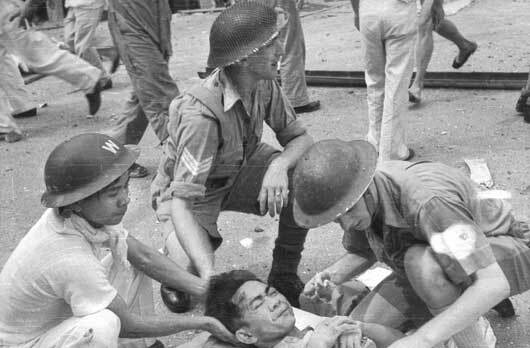 First aid helpers attending injured civilians in a city street after bombing in a Japanese air attack (AWM 011529/10). 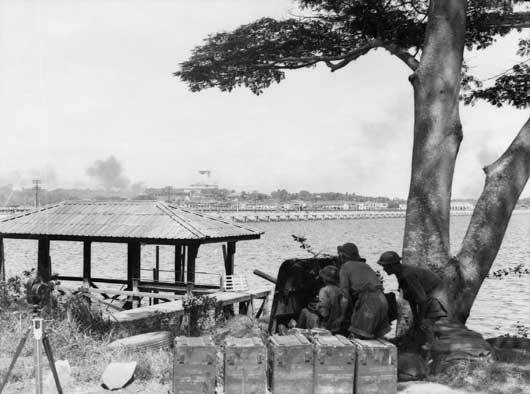 AIF anti-tank gunners overlooking Johore causeway (AWM 012449). Smoke from fires at the naval base in Singapore (AWM 012468). 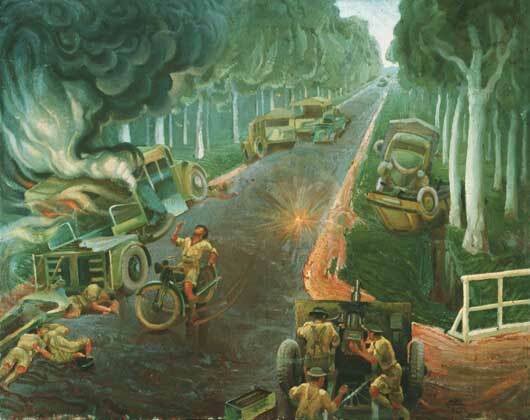 Artwork by Murray Griffin entitled 'Action at Parit Sulong, January 1942' (AWM ART24477). 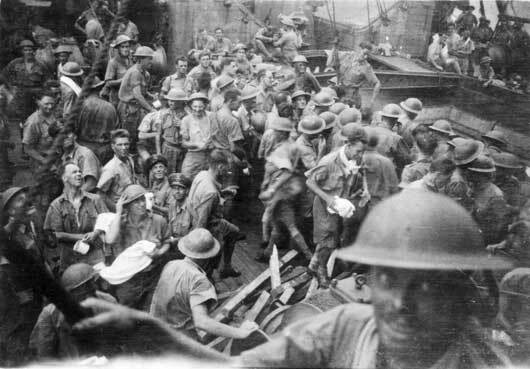 Troops on the deck of the cargo vessel Empire Star, which evacuated 2,514 people from Singapore to Batavia and was damaged by Japanese bombing (AWM P01117.008). 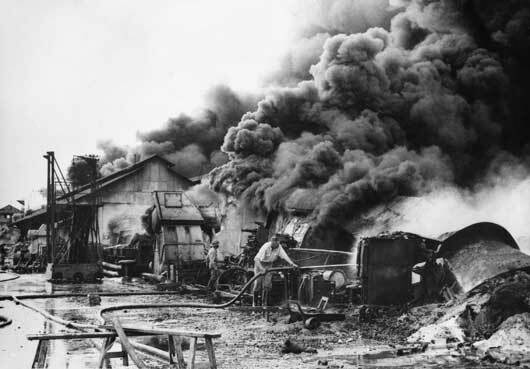 Firefighters struggle to extinguish a blaze after the bombing of the naval yards in Singapore (AWM P01182.010). 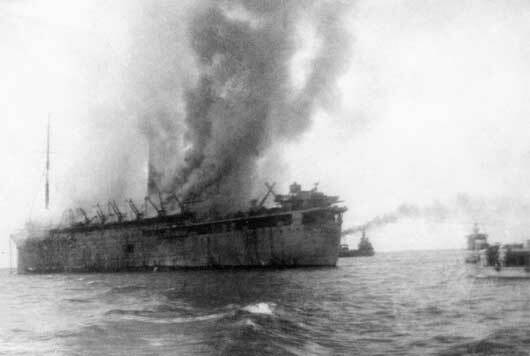 A view of the extensively damaged British transport the Empress of Asia, set on fire during a bombing attack by Japanese aircraft (AWM P01604.001).